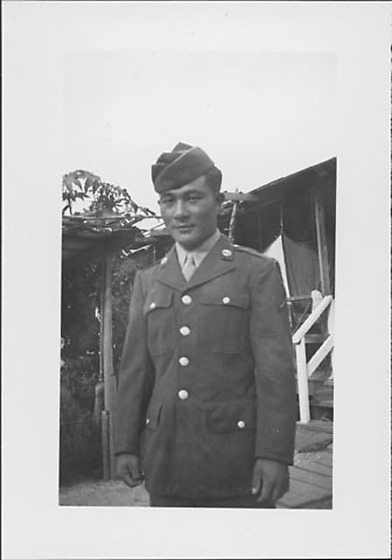 Three-quarter length view of man in United States Army dress uniform standing in front of barracks at Rohwer concentration camp, Rohwer, Arkansas, March 1945. Dressed in dark jack over light colored shirt and necktie and garrison cap, soldier looks directly at viewer. White railing of barracks, right; an arbor or canopied area in background left with broom hanging from post. Stamped in black ink on back: MAR 1945.